Discussion in 'Concentration, Death Camps and Crimes Against Huma' started by KJ Jr, Feb 15, 2019. What???? Who refuses here to understand? 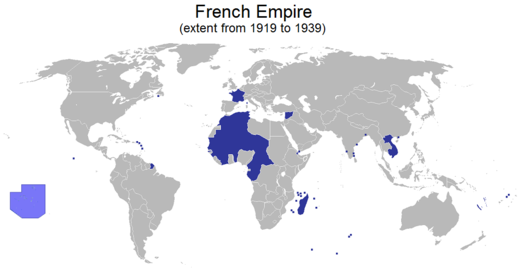 To avoid assertions of impartiality towards Her Majesty's Empire, I will show now something else, but very similar: interwar French Colonial empire (see the map below). Just observe how large was French empire, much larger than Poland and Czechoslovakia combined, both by area and population and, importantly, by the number of subjugated 2nd class subjects. There was substantially larger number of 2nd class citizens in that empire than the number of Jews in the entire Europe. By the way, Jews weren't desirable in France too, severely despised. (I am deliberately avoiding deceiving term antisemitism because there is neither anti-Bantu-ism nor any other anti-... ism). And yet: Jews weren’t treated in favorable manner in France, neither in Poland. Why then Poland and not Algeria, for example? So what was wrong with German desire to expand just a little bit by invading Poland and Czechoslovakia? I am not defending invasion of these countries, but what I do I am pointing towards real, large-scale perpetrators. Tell me now: on what moral ground France was accusing Germans and even declaring the war on Germany? Germany invaded comparably much smaller territories. Should we apply the same standards for all or should we maintain different yardsticks because you have desirable but profoundly wrong conclusions to support. If you prefer lies, you may live in your rosy world if you want, just do that but don’t preach me about what is right and what is wrong. Who doesn't understand? Who refuses to understand because the lies are preferable, compared to reality? When were most of these colonies acquired? Here's a hint it was prior to 1900. The post 1900 colonies were I believe acquired from the central powers as a result of their loss of WWII (a war they started). Furthermore at least some of those were not truly colonies but "protectorates" i.e. not being run to produce revenue for the home country but actually at a bit of a loss. Then there's issue that many of these colonies weren't really contrives in any real sense of the word so were viewed at the time as open territory. The German expansion was more than a "little bit" in any case and came in spite of signed agreements and treaties to the contrary. Of course this whole line of argument on your part is either a great illustration of you lack of understanding or an attempt at smoke and mirrors to hide the fact that comparing the British Empire or the Finns to the Nazis is totally unfounded. Even without your moving the goal posts from death camps to territorial expansion. France was living up to her treaties and reacting to Germany failing to do the same. Indeed the standards should be the same but one shouldn't argue that because the Mongols raised whole cities exterminating their populations such things are perfectly reasonable today. What was acceptable behavior for a nation in 1800 is not what was acceptable in the 1930's much less today and Germany's behavior in 1939 wasn't acceptable by European standards even in 1800. If I prefered lies I wouldn't be responding to your posts. you may live in your rosy world if you want, just do that but don’t preach me about what is right and what is wrong. Sounds a lot like the pot calling the silver ware black. To answer that question look in any convenient mirror. Why so complicated if the truth is simple: French and British Empires started the both world wars to protect their precious possessions from competitors – Germans. To provide an alibi for this global monstrosity it was necessary to isolate Poles and Jews from other victims. That is why we have even today this separation of Jews, worthy victims, from all other, deplorable victims. Once you remove this construct of worthy victims, the truth becomes clear: the both world wars were fought to protect Empires. Poles and Jews are just collateral but very convenient victims to legitimize all other murders. Now, let’s get back to the essence even though this previous discussion apparently seemed to be of-topic. Let us stop separate Jews from others. I love Jews very much, they are smart, important, likable, incredible, but, paradoxically, hated tremendously everywhere they migrated. For sake of humanity let us stop separating the Jews from other victims. All victims, regardless of their ethnicity should be treated in the same humane manner, without propaganda, western or eastern. Equally, let us stop separating Finns from other perpetrators for any reason whatsoever. A murderer still remains murderer, regardless the reason someone wants to disguise him as a victim. Regardless of propaganda narrative. Finally: French and British empires were the real perpetrators: not just across the oceans, in Europe too, but, as the victors, have used opportunity to write this propaganda history we have in front of us. Disgusting crap. Wrong. That's a fiction and a lie. You should know better. Smoke and mirrors. A murder may be a murder but there's a difference between deaths that are a result of accidents or circumsances, those caused be deliberate actions of individuals, and those caused by deliberate actions of organaizations (and of particular interest governements). Treating them as if there is no difference is not reasonable, logical, or rational. It's an attempt to distort history. That you are promoting such garbage is indeed disgusting crap. The scope and scale of the holocaust speak a very clear message. The Minutes of Meetings and documentary evidence the Nazis left behind, continue to shout across the gulf of time, and will continue to do so, drowning out other misdeeds by their sheer scale, speed, and the audacity of the crimes. No other empire came even close to this scale of atrocities. Any attempt to belittle or deflect criticism against the Nazi state genocidal mania falls flat when the comparisons include any real metric. I can only conclude that some people are just more susceptible to AfD propaganda than others. I’m not a moderator but if I was I would ban you both for minimalization of the Nazi approach to the Eastern Front. This alibi isn’t chronologically consistent: mortality rate has increased in 1943, more than three years after British and French Empires declared war on Germany. And yet, there is still no evidence that supports theory of conspiracy against Jews. You refuse to take into account what happened before 1939 to cover-up the fact that imperialists have exterminated entire population of two continents to extinction and established horrible racist regimes across Africa to plunder and exploit the “unworthy” African population. But even if we agree to focus just to the war time period, British regime just in India has deliberately caused famine that directly resulted in death of at least two million “unworthy” 2nd class subjects of Her Majesty. Deaths in India had the same cause as in concentration camps: inadequate nutrition. Simply, history has to be throughout re-examined and re-written in a fair fashion. Hide and show Jews-Only-Victimhood hoax isn’t that classy and has to be eliminated to make official history more credible. The present Finnish study is yet another selective/biased contribution that supports and defends Israeli crimes against Palestinians and Arabs. This alibi isn’t chronologically consistent: mortality rate has increased in 1943, more than three years after British and French Empires declared war on Germany. And yet, there is still no evidence that supports theory of conspiracy against Jews. There is plenty of evidence. That your refuse to acknowledge it moves you into the ranks of the deniers IMO. Wrong, completely wrong. Wrong in so many ways it's amazing you got them in one sentence fragment. and established horrible racist regimes across Africa to plunder and exploit the “unworthy” African population. Certainly some of them were but rather off topic for the current discussion. But even if we agree to focus just to the war time period, British regime just in India has deliberately caused famine that directly resulted in death of at least two million “unworthy” 2nd class subjects of Her Majesty. Deaths in India had the same cause as in concentration camps: inadequate nutrition. Except of course that it's quite clear to anyone who has studied it objectively that the famine was far from deliberate. Simply, history has to be throughout re-examined and re-written in a fair fashion. Interesting when you are trying to rewrite it to support your agenda. Hide and show Jews-Only-Victimhood hoax isn’t that classy and has to be eliminated to make official history more credible. Strawman. No one here has claimed it was "Jews Only", indeed it's been widely acknowledge that other groups were sent to the camps and that many from other groups were killed outside the campsl. At this point your word on such is worthless. Truly unfortunate. You used to make valuable contributions to this board. You used to make valuable contributions to this board. Frankly it would be more newsworthy if someone claimed no Finns had ever participated in atrocities. Knowledgeable people know that the SS found recruits all over Europe. No, haven’t changed sides, just I am personally not that susceptible to adopting unverified views either. For years I was involved in serious work where you can’t decide what is the “correct angle of view”. I am facts – analysis – conclusions oriented. Over the past decade I’ve read quite a few of history literature out of pure curiosity but, unfortunately, I have found out that the present day "historic research" is just an extension of propaganda machine which serves the needs of the present-day politics. At the receiving end there is a large group of naive listeners reiterating the mantra. They have agenda, not me. Regarding the official revisionists: IHR followers are probably the worst kind of believers I have ever encountered, a kind of obscure cult. David Irwing’s audience is the worst bunch of freaks I have ever seen, just on screen, fortunately. Van Helsing types. However, we need to know the truth and, more importantly why the lies had to be used to protect “fragile truth”? After investigating history of the 20th century I cannot agree that our past is black and white, neither I adopt more modest theory of “shades-of-gray”. History of 20th century is consistently deep black, a single black-hole in time continuum. I don’t think anyone has a solid reason to be proud of that horrible era. Now, let me get back to Finns&Jews. Consider just an air crash investigation and NTSB was directed to consider just Jewish passengers. Would they look for circumcised corpses only? Wouldn’t you say that’s odd? The point is that today we face fierce propaganda, well targeted, driven by carefully established agenda, sometimes with devastating effects. Some societies are driven to the brink of lunacy, some countries are almost uncontrollable. Exactly. And every European nation wants to disguise as victim, except Germans. I don't consider them to be the only and, some others were much, much worse. Just Germans had enough decency and guts to admit and apologize. I have a great deal of respect for Germany as a state and I have great personal relationships with Germans. They are the salt and the backbone of Europe. Interesting discussion... The last 2 years or so I've been posting on YouTube comments to videos that attract Wehraboos and deniers, quite entertaining. They confirm each other's beliefs, gain strength in their conspiracy leanings and are as Tamino said "van Helsing" types. What is concerning is that some of their conspiracy sentiment has clearly had an impact. Anti-Semitism is obviously on the rise and its directly due to the cyber age, question is....when does it stop? No, haven’t changed sides, just I am personally not that susceptible to adopting unverified views either. From my, and from the sounds of it our, view point it certainly looks like you are. For years I was involved in serious work where you can’t decide what is the “correct angle of view”. Care to explain that a bit more? I am facts – analysis – conclusions oriented. So are most of us here. Over the past decade I’ve read quite a few of history literature out of pure curiosity but, unfortunately, I have found out that the present day "historic research" is just an extension of propaganda machine which serves the needs of the present-day politics. Some of it certainly is others isn't some is in between. Lumping them all together is hardly reasonable or logical. ... They have agenda, not me. Your recent posts clearly indicate other wise. Indeed they have been some of the most agenda driven posts I've seen on this forum. ...After investigating history of the 20th century I cannot agree that our past is black and white, neither I adopt more modest theory of “shades-of-gray”. History of 20th century is consistently deep black, a single black-hole in time continuum. I don’t think anyone has a solid reason to be proud of that horrible era. Then you are only seeing what you want to see. Indeed while the 20th century witnessed some of the worst of human behavior it also witnessed some of the best. That you are blind to the latter points to a serious bias in your position. I'd say it was nonsensical and don't have any idea what kind of point you are trying to make. ???? How is that connected with your example at all? You simply aren't making any sense. The Germans were victims to an extent as well all be it willing ones in many cases. Facing up to their nations history is I agree something to be admired. Can't think of any examples other than the Communist that could qualify as "much worse" though. Is it really on the rise or just becoming more visible as such types become aware of some of the venues presented by the internet? There has been an undercurrent of these types for many years but prior to the ease in communicating via the internet they were largely invisible. Better to have them out in the open IMO where their lies and fallacies can be exposed to fact, logic, and ridicule. Can't think of any examples other than the Communist that could qualify as "much worse" though. Then you're indeed a repeater of propaganda mantra. A genuine believer. Try to think whilst reading because reading isn't just letter recognition - it is a cognitive process if you do that properly, with your own head. I... Better to have them out in the open IMO where their lies and fallacies can be exposed to fact, logic, and ridicule. Look, look. Now we can see who has agenda. Do you really feel irresistible need to debunk any idea opposing your (wrong) beliefs. Nope. Simply a matter of looking at the body count and the rational for it. From where I stand you are the one that looks to be a "believer". Comes from my schooling in science I guess. Well that and some early experiences with books that claimed to be factual but weren't. I do hate to see lies promulgated as facts. So debunking those who do so is something of an agenda with me. Not so much debunking beliefs unless they are counter factual though. PLS note however it's hardly a political agenda. I don't know if there's data to show it's on the rise compared to previous decades as people generally weren't as open about their views on denial as they are now but at the very least it's unfortunately not on the decline. I can't even begin to wrap my head around this other conversation that's taken over this thread. Hard to tell if it's in decline, increasing, or holding about the same. No really good statistics not even well defined statistics i.e. are we talking total numbers or percentages or ...? It is easier to find people advocating such things now but that's a different matter. My personal theory is that it's at least somewhat cyclical and tends to increase when there are economic problems as people look for someone else to blame.